I have no friends. 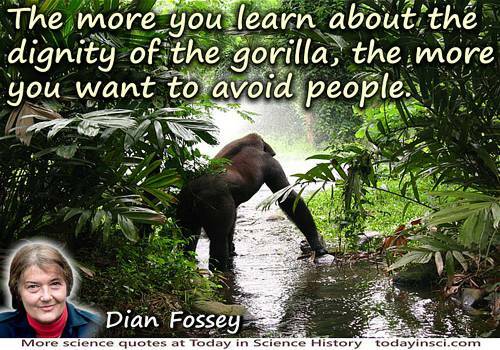 The more you learn about the dignity of the gorilla, the more you want to avoid people. From article about interview (May 1985) with Associated Press East Africa Correspondent, Barry Shlachter, at her Karisoke Research Station. Syndicated in Summer 1985. Seen, for example, in Barry Shlachter, 'Woman Fierce Protector of Gorilla Friends', Lawrence Journal-World (29 Jul 1985), 7. I have no patience whatever with these gorilla damnifications of humanity. In William Howie Wylie , Thomas Carlyle: The Man and his Books (1881), 330. Intelligence is a valuable thing, but it is not usually the key to survival. Sheer fecundity ... usually counts. 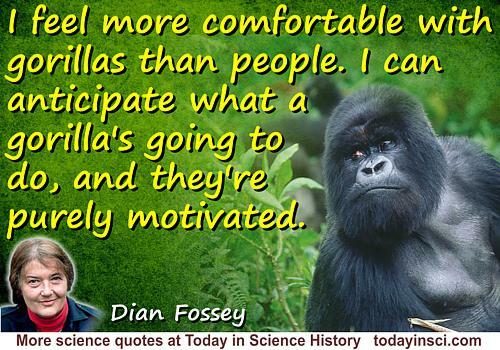 The intelligent gorilla doesn't do as well as the less intelligent but more-fecund rat, which doesn't do as well as the still-less-intelligent but still-more-fecund cockroach, which doesn't do as well as the minimally-intelligent but maximally-fecund bacterium. 'Fifty Million Big Brothers'. The Magazine of Fantasy and Science Fiction (Nov 1978), 55, No. 5, 93. It appears, nevertheless, that all such simple solutions of the problem of vertebrate ancestry are without warrant. They arise from a very common tendency of the mind, against which the naturalist has to guard himself,—a tendency which finds expression in the very widespread notion that the existing anthropoid apes, and more especially the gorilla, must be looked upon as the ancestors of mankind, if once the doctrine of the descent of man from ape-like forefathers is admitted. A little reflexion suffices to show that any given living form, such as the gorilla, cannot possibly be the ancestral form from which man was derived, since ex-hypothesi that ancestral form underwent modification and development, and in so doing, ceased to exist. 'Vertebrata', entry in Encyclopaedia Britannica, 9th edition (1899), Vol. 24, 180. 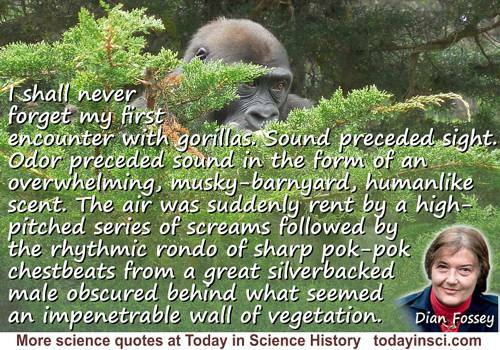 It was their individuality combined with the shyness of their behavior that remained the most captivating impression of this first encounter with the greatest of the great apes.